I got interested in this book after watching a documentary called MAMA AFRICA at the Montreal Black Film Festival. I was so stunned by the depth of my lack of knowledge on this lady that i decided to order the book right away. This is her official biography that was written in 1989, so i could not find it anywhere. Eventually, i managed to buy it from a rare book store online. The store name is Gallowglass Books Ltd. I am really happy i could get a hold of this one, it is a really great book. First, a word on that documentary, it was produced in 2011 by Mika Kaurismaki more details can be found here. You might be able to order it online. Myriam Makeba is such an emblematic figure in black Africa that she acquired the name MAMA AFRICA during her life. That documentary was so beautifully made. It showcased a collection of her footage on scenes during her career, the persons she worked with during her lifetime, her band, her neighbours in South Africa before she left, her family, the people she met… If you did not know much about her before watching this, this is it. The ultimate biography about her life, her mission and her work. What did watching the documentary do to me? It compelled me to buy her book and read more about her. I was so mesmerized by this larger than life women. Such an inspiration for the younger generation. Her message resonated with me on so many levels, more than 40 years after. Try and watch this documentary if you can. I can promise you that you won’t be disappointed. The biography was written in collaboration with a journalist James Hall in 1989. 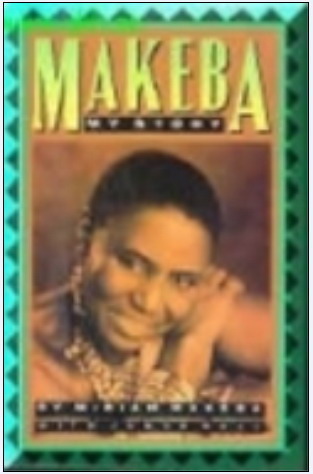 The only thing i knew about Zenzi Makeba, when i was growing up, was her song “Pata Pata”. This is her most popular song. Let’s not forget that she was really active in the 1960-1970’s. I was not even born, then. The book started with her early life in South Africa. I love the details surrounding her birth and her early life in Johannesburg. One great thing about the book is that it included pictures of her childhood and her life in General. So we get to see her mother the Isangoma or traditonal healer. I did not know much about life in precolonial South Africa, so it was great reading about it. Myriam Makeba was one of the most controversial figure of her time. Firstly, Because she came to the US , when there was so much segregation and racism. In her book, she described how she was truly shocked by the life of black people in America, this great country. We must remember that she left, the apartheid regime in South Africa, thinking that such things only exist in her country. Secondly, she met and collaborated with Mr Harry Belafonte, who was a civil right activist and a singer. And thirdly, she got involved and married Mr Stokely Carmichael, who was himself very controversial. He was a black activist active in the 1960s American civil right movement and the Black Panther movement. Sitting on my couch and reading this story, i was totally and absolutely stunned by the greatness of all the people mentioned in this book. The 1960s and 70s were not the greatest time for black people. But against all odds, people like Zenzi Makeba rise to such height and made an impact on the life of their countrymen. The book speaks about the evil that was the apartheid regime. The impact it has on the black people. For example, she spoke of the massacre of Soweto. The movie,Sarafina, that was produced in 1992, talked about that massacre also. Some school children in Soweto were opposing colonialism in general and Afrikaans, but the apartheid regime riposted by sending the police to killed them. This is an excellent movie to watch, but i must warn you that it is really hard to watch. 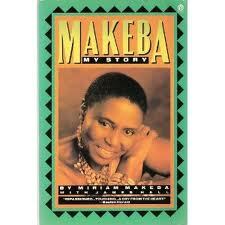 The book is a reflection on Myriam Makeba’s life up that point. Her music, her stay in the US including her relationship with the civil right movement, her life with Stokely Carmichael, Her exile back to Africa, her struggle to liberate South Africa, her struggle to adjust to a new world, a new generation when she went back to the US some 10 years later, her friendship with a lot of the liberation father’s of Africa (Sekou Toure, Jomo Kenyatta, Samoa Machel…) and her different losses (she lost her only daughter). It is important to point out that she was one of the style icon of her time. By that, i mean she always wore African attire on stage and hairstyle from different parts of the continent. She said in her book that whenever she visits a country , she was always influenced by the style of women and by the music. She died in 2008 of a heart attack, after she performed at an event in Italy. She will forever be in our mind and heart for the role she played in the making of modern day Africa. Did you get a chance to read this book? Let us know what you think about it? As always, you can drop us a line at utneemtre@gmail.com.